Next up: Dave Ruchman, who served two terms on the board from 2000 to 2008. Ruchman is running to represent District M, which covers all of Golden, Lakeside, Mountain View, the majority of Lakewood and Wheat Ridge, and portions of unincorporated Jefferson County. His opponent is Natalie Menten, the incumbent. Why are you running (again)? I’m really interested in public transportation. That doesn’t mean I have all the answers to everything, but I’ve been tracking RTD now for over 20 years. In March of 1995 I was appointed to a committee that had a very loose mandate, which was to look at opportunities to enhance public transportation coming out of downtown Denver toward JeffCo and the mountains. In a process like that, it’s the people who are there at the end of the day who get to make the decisions and get to offer some recommendations. And so I was there at the beginning of the day and at the end of the day. In a sense, that got me hooked. I’ve been very disappointed with recent ridership. Right now I think we have a director who has really been largely invisible for three years and has not had much of an impact. 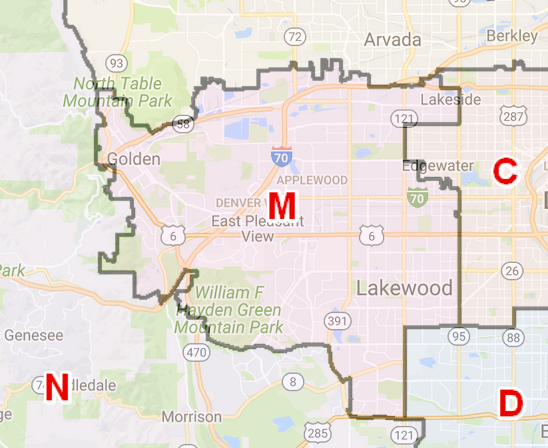 There are three major cities in the district: Lakewood, Wheat Ridge, and Golden. Months ago when I asked mayors of two of them, “Who is your RTD representative?” They were like, “I don’t know.” That’s not gonna happen if I’m director. [Menten] is the taxpayer candidate. She says she’s always saving everyone money, so she always votes no. After the first 15 or 20 times you do that, people say, “There goes Natalie again.” She doesn’t have much of an effect or impact on behalf of this district at RTD. So that’s part of it. But mainly I’m running because I have some ideas and I would like to get in the mix, I would like to be on the board, and I would like to share my ideas. I would like to move the needle a bit. What are some of those ideas? One of them would be, back about 10 years ago, two general managers ago, I got the agency to start a sustainability program. When you get on a train or a bus, and you forswear your car, that by itself is a sustainable act. But this agency, like others around the country, can take positive steps to become more sustainable. So I’d like to help shrink RTD’s carbon footprint. They’re doing some good things, but I think what they should do is get a coordinator, someone to quarterback all the sustainability activities at RTD. Second, what I plan to do as soon as I get elected is begin a collaborative partnership process. When I was director, once a month, the elected officials and all the pertinent staff met, and we learned about the issues, we hashed them out, we asked and answered questions. I presided over that — it was my idea. You were around when FasTracks started. What’s next, now that it’s largely built out? It would be a family friendly, family forward policy, and you might even prime the pump, and get more of the adults in those families taking rail, taking bus, taking RTD. I don’t know how much that would cost, because they have no way of knowing because they don’t know who gets on. But it’s a thought. And so if there is a peer agency across the country — Charlotte, Seattle, Orange County — that has experimented with that, it’d be nice to see the data. What are the issues facing your district? What I hear most, predictably, is, “RTD? Never use it.” Mine is a classic suburban district. For the most part, people think about RTD when they’re stuck behind a bus. It’s the suburbs. People grow up, and they become adults, and they go through the kitchen door into the garage, and they flip the garage door opener, and they hop into the van or the SUV, and away they go. And 40 years later they retire, and they have no experience with RTD. But as older people stop driving, RTD becomes all the more important. To me, that offers a lot of potential. One potential market is seniors across the board. Another potential market is off-peak, off-commuter service. So whether it’s midday or whether it’s Saturday, Sunday in particular, or night service, those are growth opportunities. The people who hang out downtown — they know if they take the bus or the train, they can have another beer or two before they stop drinking and the bars shut down and have to go home. That’s fine, but I would like to see RTD market the W-Line to everyone because it’s underutilized. Do you think it’s RTD’s role to grow ridership? To get people out of cars and use the system? I would like to see RTD be a more forward agency across the board. So, to me, it’s not enough for RTD to say, “Look, other people can help us with this. Our task is to provide buses and para-transit and trains, and we hope people get on.” If push came to shove, what RTD would say is, we provide the ride. We hope people will get on, but we can’t force them. We really want to make it available. That’s our task. What I would say is, I want them to be a little more forward in the transportation leadership field… I want them to be on the cutting edge of moving away from carbon and gas and cars toward public transportation and alternate transportation in general. And they kind of get that, but when push comes to shove, they just provide a ride.